I was first exposed to Java after several years of C++ experience and so it seemed natural when I learned that Java does not allow method overloading based on return type. The Defining Methods section of the Classes and Objects lesson in the Java Language Tutorial states, "The compiler does not consider return type when differentiating methods, so you cannot declare two methods with the same signature even if they have a different return type." Indeed, as Vinit Joglekar has pointed out, "It is an accepted fact that Java does not support return-type-based method overloading." The StackOverflow thread Java - why no return type based method overloading? explains why this is the case in Java. Given this, I was surprised when a colleague showed me a code snippet with two overloaded methods with the same runtime signature that compiled in JDK 6 as long as the return types differed. The following class compiles successfully with JDK 6, but not with JDK 7. * Simple example that breaks in Java SE 7, but not in Java SE 6. * @param arguments The command line arguments; none expected. As described in Angelika Langer's What Is Method Overloading?, the above code should not compile. It doesn't in Java SE 7. In NetBeans 7.1, it doesn't. Or, more properly, it's a mixed bag. 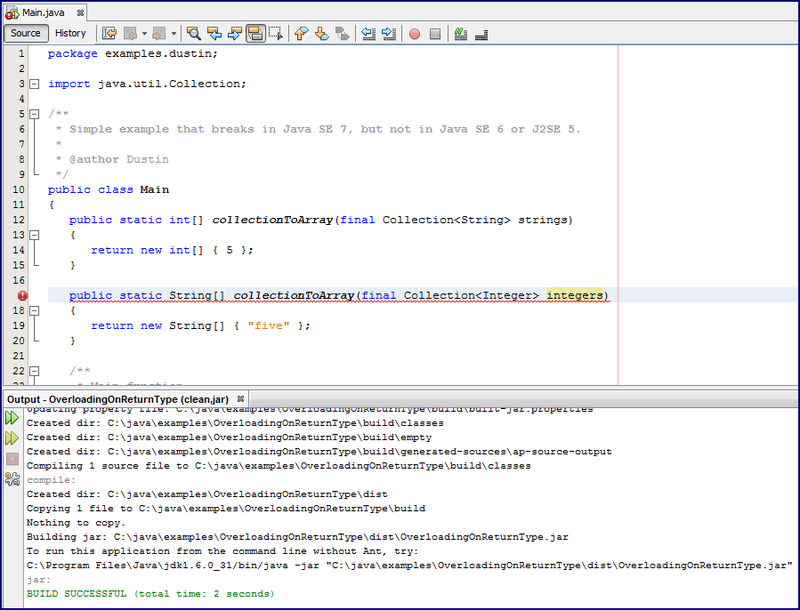 As the screen snapshot below demonstrates, NetBeans 7.1 builds the source code above fine as shown in the Output Window when the version of Java associated with the project is Java SE 6. 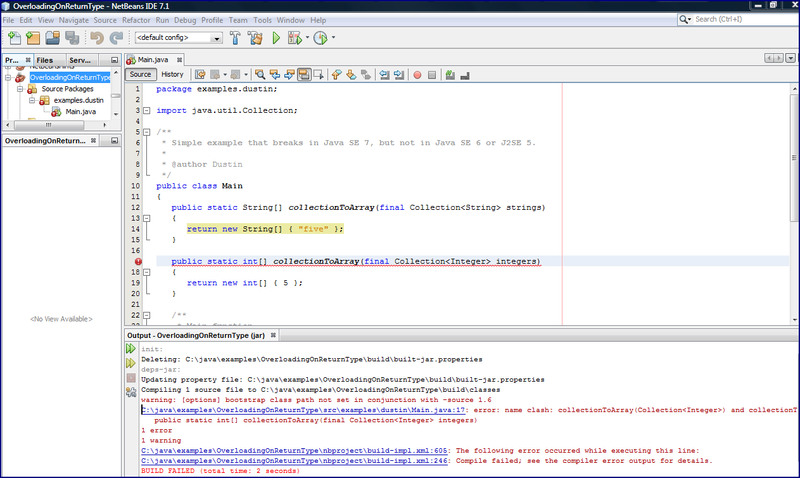 However, the NetBeans editor shows the red squiggly lines indicating compiler error. The next image shows what the error message is. 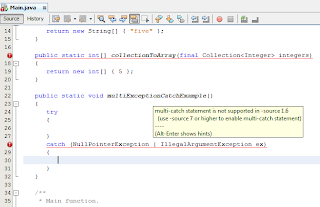 Although NetBeans 7.1 is able to build the code shown above when it's part of a project associated with Java SE 6 (Update 31 in this case), the code editor still reports the error shown above. This is because NetBeans uses a different version of the Java compiler internally than the one explicitly associated with the project being edited. 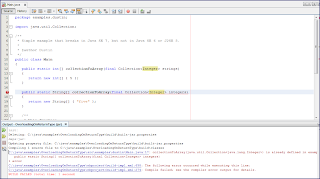 If I change the version of Java associated with the NetBeans project for the source code above, it will no longer build in NetBeans. This is shown next. There are a couple interesting things about this bug. 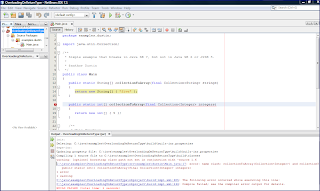 First, the fact that this code compiles fine in Java SE 6 but is addressed and does not compile in Java SE 7 means that it is possible for code working in Java SE 6 to not work when the code base is moved to Java SE 7. I downloaded the latest version of JDK 6 available (Java SE 6 Update 31) and confirmed the original code shown above still builds in Java SE 6. It does not build in Java SE 7. There are other versions of the code above that do not build in Java SE 6 or in Java SE 7. For example, if the code above is changed so that the methods return the same type, the code doesn't build even in Java SE 6. Similarly, if the Collection parameters to the two overloaded methods include a "raw" Collection (no parameterized type), it won't compile in Java SE 6 either. Of course, even if the return types are different, if the same Collection parameterized types are passed to both overloaded methods, even Java SE 6 won't compile this. These three situation are depicted in the following three screen snapshots. The code that builds in Java SE 6 but not in Java SE 7 needs to have overloaded methods that differ in both return types and in terms of the parameterized types of the collections that make up their method parameters. It doesn't matter if a given return type matches or is related to the parameterized type of the method's parameter as long as they differ. 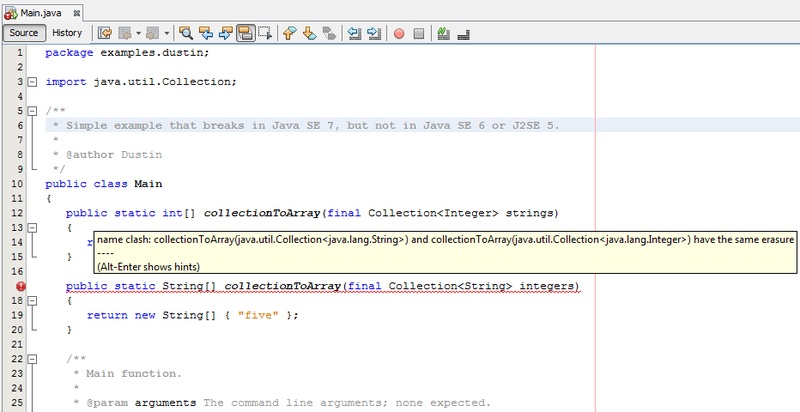 If the return types are the same, Java SE 6 detects a compiler error. 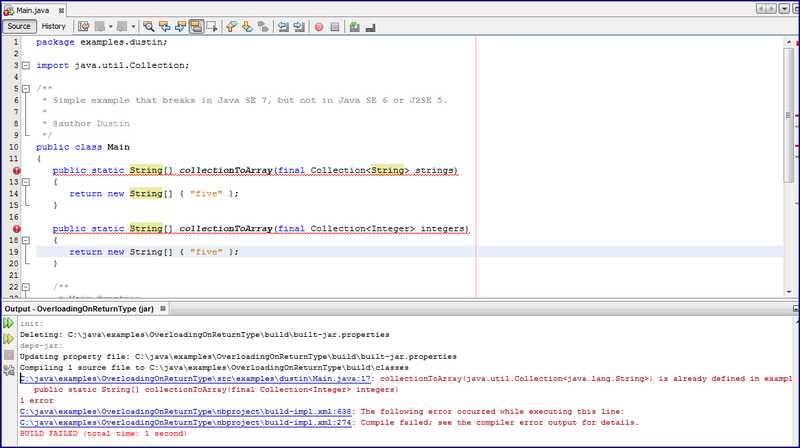 Java SE 6 also detects the error if the erased parameters boil down to the same collection after erasure and the return types are not different. 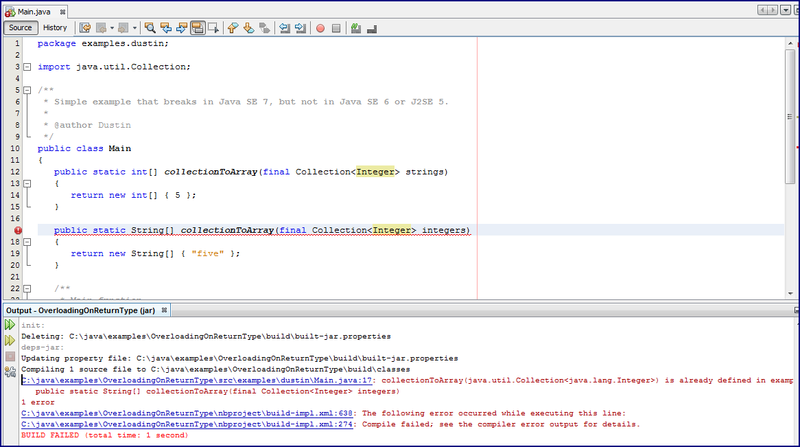 A second interesting thing about this bug is how its handled in NetBeans. 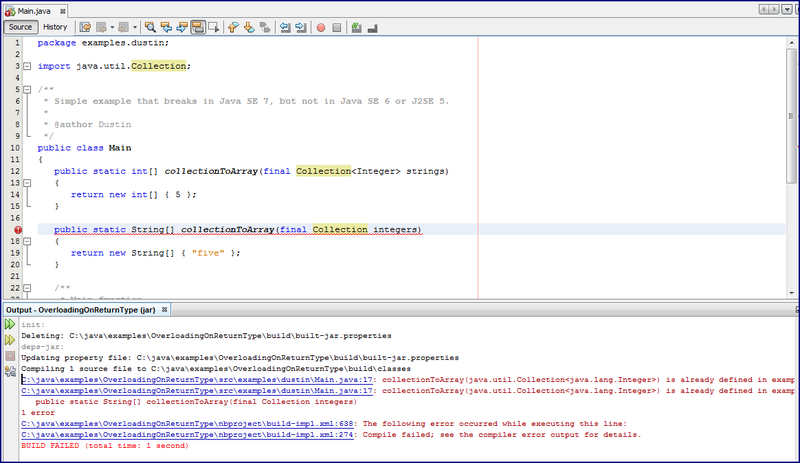 Because NetBeans use its own internal compiler that does not necessarily match the version of the compiler that the developer has associated the IDE project to, you can run into situations like this where the code actually builds in the IDE, but the IDE's functionality such as code editors and project browsers indicate the code breaking. 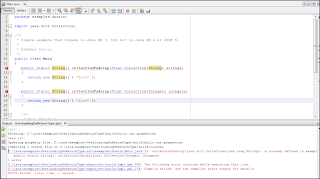 Because NetBeans 7.1 uses its own internal Java compiler for the code editor, one might wonder if this means Java 7 features could be sneaked in and would work in the IDE but then would not build when attempted from the command line or when explicitly built in the IDE. The next screen snapshot demonstrates why that is not the case. 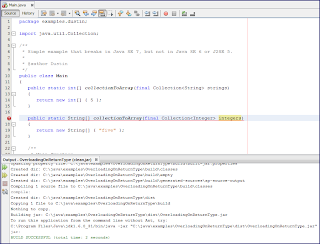 In that snapshot, a Java 7 specific feature is in the code and NetBeans 7.1 properly warns that this is not compatible with the Java 1.6 source setting. 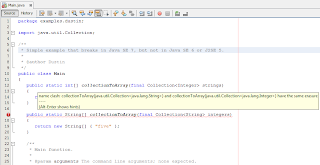 Bug 6182950 (methods clash algorithm should not depend on return type) has addressed the issue in JDK 7, but not in JDK 6. A related bug is Bug 6730568 ("Type erasure affects return types + type parameters"). Three additional references that provide sufficiently more background details are two StackOverflow threads (Differing behaviour between Java 5 & 6 when overloading generic methods and What is the concept of erasure in generics in java?) and the Java Tutorial entry on Type Erasure. 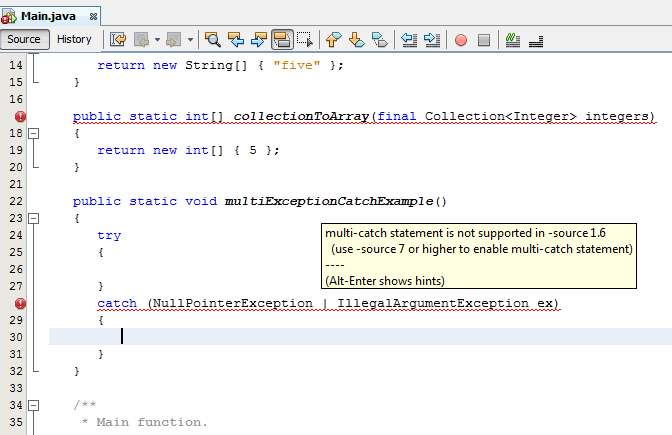 The colleague who showed me this issue realized its existence because NetBeans 7.1 reported the "name clash ... have the same erasure" even when he was working with Java SE 6 code. 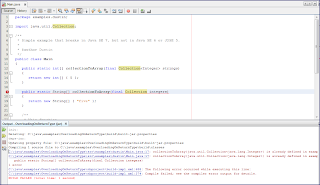 This discovery was "accidental" due to the newer version of NetBeans using Java SE 7 compiler internally, but he welcomed the opportunity to fix the issue now rather than when he migrates to Java SE 7. I found this issue worth posting a blog post on because it provides a warning about a bug that may already be in some Java SE 6 code bases but will be made all too evident when the code base is moved to Java SE 7. I also posted this because I think it's important to be aware that modern versions of NetBeans use an internal compiler that may be of a different version than the compiler the developer has explicitly associated with his or her NetBeans project.